Info "I may be a giant, but that doesn't mean Jack can steal from me. I'm gonna slap him right out of the sky." Slap Jack! is one of Kat and Ana's microgames in WarioWare: Twisted!. It is based on the fairy tale, "Jack and the Beanstalk". In the Japanese version, this microgame is instead based on the story Journey to the West. The name of the microgame is a portmanteau of the words "slap" and "flapjack", which is another name for a pancake. It is also a pun on the card game "slapjack." 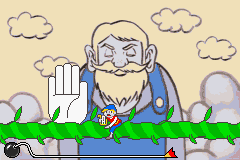 The player controls a giant's hand. The game's purpose is to make him slap Jack who passes by the vine. If done so, the game is won. However, if he misses, the player will lose. The gameplay remains the same in the Japanese version, but it involves Buddha slapping Sun Wukong off the clouds. 1st level difficulty: There is one Jack. 2nd level difficulty: There are two Jacks. 3rd level difficulty: There is one Jack, however, he may jump forward or backward once he gets close to the giant's hand. This page was last edited on November 23, 2018, at 20:49.